Tractors and farming are nearly one and the same. Tractors are used to do many things on the farm from mowing ditches, to planting corn to hauling rocks and grading the driveway. 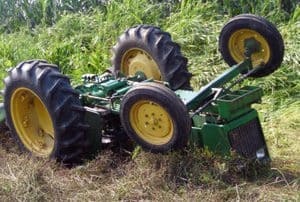 Unfortunately tractor rollovers can and do occur too often, whether it is on the small hobby farm or in larger production agriculture operations. Tractor rollovers are the single deadliest type of injury incident on farms in the United States. The latest figures from the National Institute of Occupational Safety and Health (NIOSH) suggest there are approximately 130 tractor rollover fatalities per year. 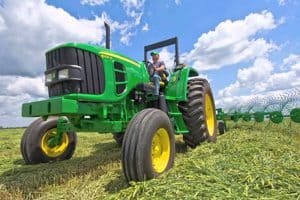 NIOSH estimates that there are approximately 4.8 million tractors in use on U.S. farms; one-half of them are without rollover protection for the operator. In addition to the human cost of tractor rollover, there is a financial cost as well. Roughly 7 out of 10 farms go out of business within 5 years of an accident. Rollover protection structures (ROPS) are 99% effective in preventing injury or death in the event of an overturn when used with a seatbelt. 197 close calls and 16 serious injuries/fatalities have been prevented since the NRRP began retrofitting tractors with ROPS in 2006. The National ROPS Rebate Program (NRRP) offers farmers 70% off costs with a maximum out of pocket cost of $500 (for the farmer) in rebates for rollover protection installedon unprotected tractors. Minnesota and Wisconsin are two states that are currently offering rebates through the NRRP program. As of September 2018, ROPS retrofits were completed on 336 tractors in Minnesota and 232 tractors in Wisconsin. Even if your state is not currently offering rebates, find out what it would take to retrofit your tractor(s) by contacting the NRRP.